It seems we've had a fair amount of evidence regarding iWatch's existence, but very little on how the smartwatch might actually function. 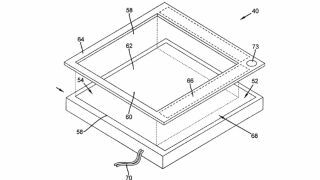 But a new patent may drop a few clues, outlining a special bezel technology that would add touch controls to the border surrounding a small screen. Not only that but the bezel space would also be able to work dynamically, appearing as a border around the display and disappearing to maximise screen real estate when you're using it. The story gets even more interesting when some of the background details come to light, as the patent was originally Kodak's, which Apple recently purchased. "A sensor system sense when a person is close to touching the bezel or when a person is in touch with the bezel and generates a sensor signal," reads the patent description. "And a controller is operable to adjust the appearance of the active area in the part of the second portion when the consoler determines that a person has touched the bezel or is close to touching the bezel." Of course, this isn't just something we'd expect to see on the iWatch - we can see the iPhone and iPad Mini taking advantage of this technology one day too.